WALHI is the Indonesian Forum for Environment. 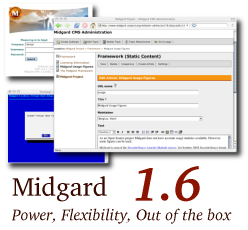 Their CMS implementation will be modelled after the Midgard solution deployed by The Wilderness Society Australia. It is very nice to see NGOs deploy Open Source CMSs, or more specifically Midgard. These organizations have much to gain from efficient communications, and Open Source is the cost efficient way to accomplish that. Open Source is also ideologically closer to many NGOs than proprietary software. Another thing about NGOs is that they also seem to be giving back to the community by sharing their experiences and documentation. The Wilderness Society documented their deployment into the NGO Geeks website. Thanks to Uung H.R. Bhuwono for informing be about the WALHI blog. Tactical Tech is working to bring NGOs and the Open Source community closer to each other. Their Summer Source event brought Open Source developers and NGO techies together to learn and discuss common problems. They also package NGO-in-a-box, a distribution targeted at providing the whole NGO software environment with Free Software. 02 November 2004. 1 minute read.